Vincent van Gogh felt he was a failure in his lifetime, borrowing money for food and paints from his brother Theo. 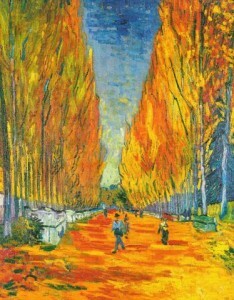 If only Vincent could know that his painting of the Alyscamps cemetery in France sold May 5, 2015 for $66.3 million! Read our StoryBrief about his trip to the cemetery with Paul Gaugin and how one artist influenced the other to paint beyond what was immediately seen. And our multi-chapter Vincent van Gogh Story provides yet more insight into the life of this artist who changed how we all see things. For tips on how to leverage natural student interest in van Gogh’s art and life, take a look at longtime adjunct professor Sandie Linn’s StoryBrief “Teaching with AwesomeStories Vincent van Gogh Story to Deepen Reading, Reflection and Writing for ESL Students”.